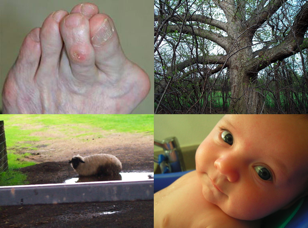 Which of these four images do you want to look at? Do you think you answer would be different if you were looking at them by yourself, or if you knew someone else was looking at the same time as you? We have called these experiences joint perception, and have been investigating the phenomena in a series of eye tracking experiments. Typically, being a participant in a cognitive psychology experiment is a lonely experience . You sit by yourself in a lab cubicle, are shown stimuli and make responses. In contrast, when you step out of the lab into the classroom or the workplace, you exercise the same cognitive processes studied in lab in the midst of a rich social world. Social psychology and social cognitive neuroscience have shown that behaviour and brain mechanisms are highly sensitive to social information. But, as yet, we have little idea of how social variables interact with cognitive processing. Recently, there have been fascinating experiments studying joint action, where two people perform cognitive tasks by themselves or with another (Sebanz, Bekkering & Knoblich, 2006). Being in a minimal cooperative situation appears to evoke particular mental representations in the individuals, even when it is not necessary for the task. Following these ideas, we decided to investigate how very simple perceptual processing might be influenced by the knowledge that it is done alone, or with another. Participants came into our lab two at a time. They sat in eye tracking cubicles next door to each other. For about 15 mins they saw sets of four pictures appear on screen, much like those above. Each set contained a pleasant and an unpleasant image, and was seen for eight seconds. We measured whether they looked at the pleasant images, such as babies, cakes, flowers and sunsets, or unpleasant images, such as rotting food, bodily deformities and scenes of violence. Before each set of pictures, they heard either ‘You will both be looking at the same pictures,’ or ‘You will be looking at pictures; your partner will be looking at symbols’. Participants could not see each other, nor could they see each others’ eye movement patterns. They simply looked at the pictures thinking that they were looking alone, or at the same time as someone next door. You can see example eye movement recordings of two participants looking at pictures together , and looking at the same pictures, but believing that they are looking alone . Our results surprised us. In the graphs below, time is on the horizontal axis, and probability of looking at each region is shown on the vertical axis. On the graph on the left you can see that in the looking together condition, an initial preference for the negative stimuli gives way to a preference for the positive stimuli. In the looking alone condition, on the right, people continue to prefer the negative stimulus. This overall difference in looking times across conditions produced a statistically significant interaction. Why do people look at negative stimuli when they think they are looking alone, but positive stimuli when they think they are looking together? We are currently trying to answer this question. You can read some of our ideas in the paper below, or contact us if you have suggestions. What is clear, however, is that a very minimal difference in social context produced an interesting difference in perceptual behaviour.